Cairo, Egypt, 7 April 2019: The African Union Commissioner for Infrastructure and Energy, H.E. Dr. Amani Abou-Zeid and the Egyptian Minister of Electricity and Renewable Energy, H.E. Dr. Mohamed Shaker El Markabi, met in Cairo today to sign the Host Country Agreement for the organization of the second edition of the Specialized Technical Committee on Transport, Transcontinental and Interregional Infrastructure, Energy and Tourism (STC-TTIIET) to be held from 14 to 18 April, 2019 in Cairo, the Egyptian capital under the theme “Developing SMART Infrastructure to boost Africa’s Continental Transformation and Integration”. Minister Mohamed Shaker El Markabi said that hosting the STC meeting will be a great honour for Egypt as it reflects the leadership role the country has played and continues to play in the development of infrastructure in Africa. The Minister emphasized that the signing of the Host Country Agreement reaffirms the full commitment of the Government of Egypt to the successful organization of the Meeting. In the same light, African Union Commissioner for Infrastructure and Energy, H.E. 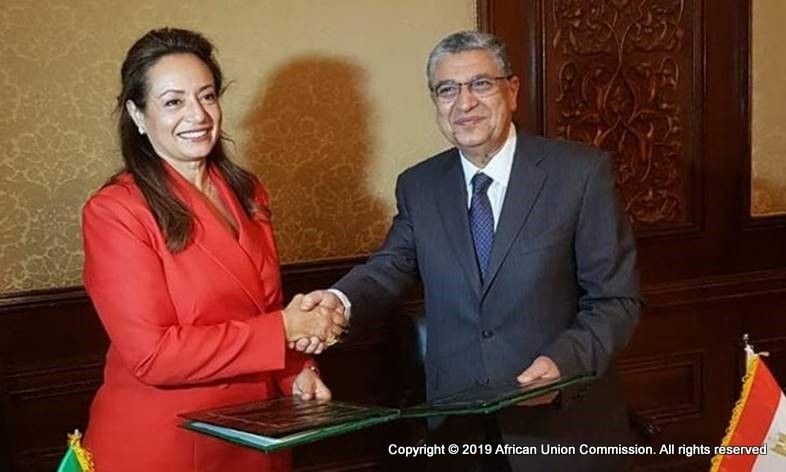 Dr. Amani Abou-Zeid, expressed her gratitude to the Egyptian Government and noted “the agreement that we signed today, together with the strong cooperation we have enjoyed from the Government of Egypt throughout the preparatory process, paves the way to the development of transport and energy infrastructure as well as tourism for the successful attainment of AU Agenda 2063 goals. "It would be acknowledged that the second session of the STC-TTIIET is taking place in a context abound with a wealth of decisions, actions and information tailored to the goals of the STC,” the Commissioner stated. In that regard, H.E. Dr. Amani Abou-Zeid affirmed that the meeting will focus on actions undertaken and planned for implementation of agreed activities rather than on conceptual and brainstorming exchanges. “To that end, the main objectives of the second session will be, first and foremost, to evaluate implementation of the updated STC Plans of Action as well as address the challenges and, finally, agree on the way forward,” the Commissioner added. . The Host Country Agreement, which covers all the logistical requirements for the meeting, is an important landmark towards the success of the STC meeting. The signing event was the culmination of a three-day visit to Cairo by African Union Commission officials to finalize the details of the meeting including the budget for the Conference; logistics and preparations; information and communications technology for the Conference; and security. The second edition of the Specialized Technical Committee on Transport, Transcontinental and Interregional Infrastructure, Energy and Tourism (STC-TTIIET) is organized by the African Union Commission (AUC), in collaboration with the Government of the Arab Republic of Egypt, the African Development Bank (AfDB), the United Nations Economic Commission for Africa (UNECA) and the African Union Development Agency (AUDA-NEPAD). The biennial gathering is the most prominent meeting of Ministers responsible for Transport (i.e. Air, Road, Railway and Maritime Transport), Energy and Tourism sectors, and groups of experts from Regional Economic Communities (RECs), Regional Development Banks, Financial Institutions and the continental specialized organizations, international organizations, academia, business and civil society bringing together more than 500 professionals from all around the continent. The Specialized Technical Committee (STC), is the Ministerial decision-making organ of the African Union for the transport, energy, tourism sectors as well as overall infrastructure development matters. It was established with other similar sectorial organs initially as the Committee on Transport Energy and Communications under Article 25 of the African Economic Community Treaty (the Abuja Treaty) adopted by the Assembly of the Organisation of the African Unity (OAU) in 1994 and, subsequently, under Articles 14, 15, and 16 of the Constitutive Act of the African Union adopted by the AU Assembly in 2000. It was finally reconfigured into the STC on Transport, Transcontinental and Interregional Infrastructure, Energy and Tourism in February 2009 by the AU Assembly through its decision: Assembly/AU/Dec.227 (XII). Replacement of the sector specific Ministerial conferences with STCs, is aimed at fostering multi-sector dialogues and, hence, formulation of comprehensive development strategies for the concerned sectors. STCs are expected to provide a platform for all stakeholders including the private sector and academia to share knowledge, experiences and solutions to common challenges in the development of the concerned sectors.In accordance with its Rules of Procedure, the STC meets biennially (once every two years). Institutional arrangement of the STC, its Sub-Committees and working groups enables all stakeholders to be adequately informed and involved in the implementation and reporting mechanisms of the STC Plans of Action. The first meeting of the STC took place from 13 to 17 March 2017 in Lomé, Togo under the generous hosting of the Government of the Togolese Republic. The first session of the STC-TTIIET rallied around the theme: Financing Infrastructure in Africa.